Tottenham’s unlikely place in the title race remains a reality after a third consecutive Premier League win earned in the final 10 minutes. For more than 80 minutes at Wembley, Mauricio Pochettino watched his team thwarted at every turn by a Newcastle side set up in typically obdurate fashion by Rafa Benitez. Son Heung-min had been crucial to Spurs’ late comeback win against Watford only three days earlier, however, and the South Korean proved his importance once more with a powerful late strike that should have been stopped by Magpies stopper Martin Dubravka. The win means Tottenham are now only five points behind leaders Liverpool, and three behind champions Manchester City. 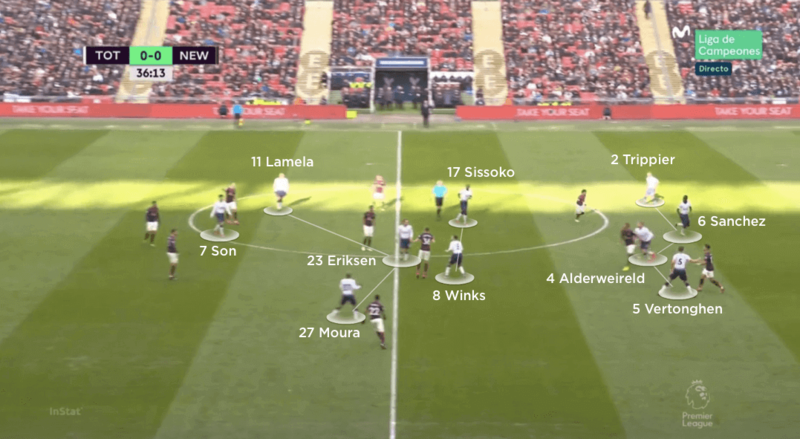 Mauricio Pochettino set Tottenham Hotspur up in a 4-2-3-1 formation, but after various rotations in midfield they attacked with an asymmetrical structure. Up against Newcastle United’s extremely low and compact block, right-back Kieran Trippier moved very high to provide attacking width on the right, with Son Heung-min stretching from the left side. Moussa Sissoko thus dropped out of the hosts’ double-pivot, where he started alongside Harry Winks, to cover Trippier’s advances. Christian Eriksen roamed across the central lane, sometimes helping to form an attacking diamond but mostly moving alongside Winks as a deeper creator. 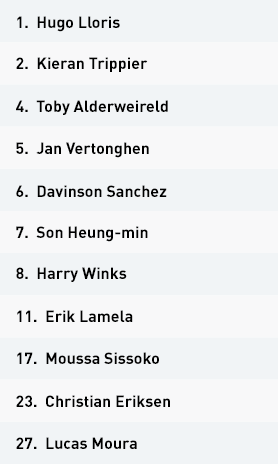 With Son pulling out wide to the left, Erik Lamela and Lucas Moura would then be Spurs’ two highest central attackers, occupying the gaps between Newcastle’s three central defenders. Despite all their early possession, however, the hosts struggled to play through, around or over Newcastle’s intensely compact block. Spurs’ first real chance actually came during the second phase of a routine set-piece, with Moura heading wide from close range. A second headed chance soon followed after wide play around Newcastle’s block, but a cross from Jan Vertonghen – playing at left-back – was powered on to the crossbar by Lamela. The visitors responded by pushing their wing-backs on to the Spurs full-backs – this reduced the home team’s ability to put in early crosses, but stretched the space between the Newcastle wing-backs and centre-backs. Inside runs from Son or Winks – usually as the third man in a sharp passing sequence – allowed Tottenham to penetrate centrally, and focus on cutback crosses between the visitors’ lines. That said, Newcastle still had the numbers back to block any attempts on goal, as Spurs’ frustrations grew. The introduction of Fernando Llorente for Moura after an hour gave the hosts their first real aerial presence. The Spaniard’s ability to hold up play or flick the ball on for runners gave the hosts an extra dimension, which in the end won them the game. Son now attacked from a more central position, working off anything Llorente could feed into him, and it was from a low, swerving shot that the South Korean beat Martin Dubravka for the game’s only goal. Tottenham set up in the same 4-2-3-1 structure out of possession, but were largely untroubled for long spells. 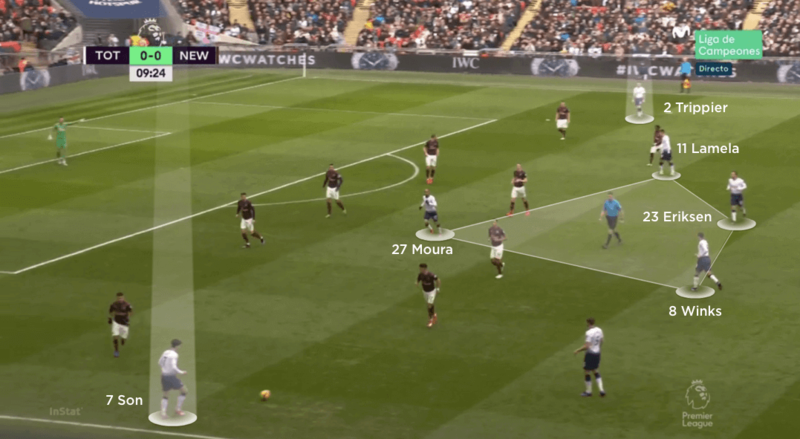 The visitors initially looked to hit Salomon Rondon where possible, but centre-backs Davinson Sanchez and Toby Alderweireld pressed him from each side; with limited supporting numbers – Newcastle’s entire outfield unit set up so deep from the outset – additional counter-pressing from Winks frequently led to regains. The hosts’ defence did come under some pressure if they failed to win the loose ball from long goal-kicks from Dubravka. With Spurs narrowing and squeezing any central balls, Newcastle occasionally managed to work the ball out to their wing-backs, with Matt Ritchie’s powerful crossing coming into play. With the away side now playing even more direct to Rondon, and getting numbers in central areas to challenge for the subsequent loose balls, they were more consistently able to get the ball wide and put crosses in – this led to Rondon hitting the post with one header, but Tottenham held on to keep a clean sheet and pick up an important three points. Tottenham set up in a 4-2-3-1 formation, but their attacking width was initially provided by Kieran Trippier on the right and Son Heung-min on the left. 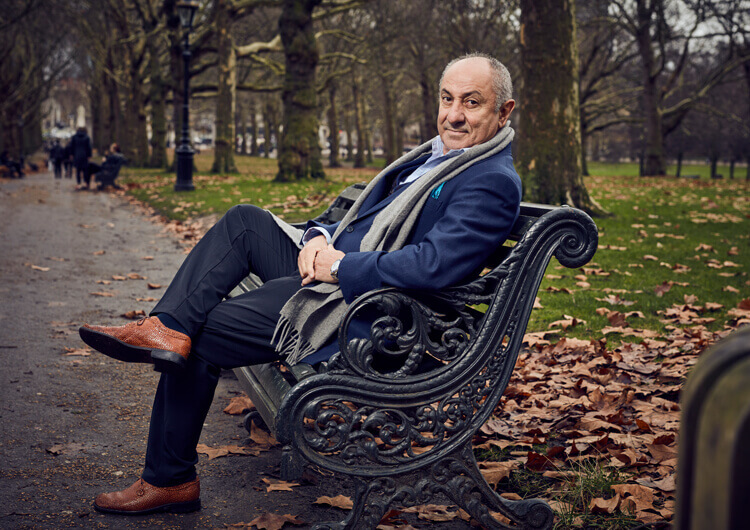 Moussa Sissoko covered Trippier at right-back, leaving Erik Lamela, Lucas Moura, Christian Eriksen and Harry Winks in a central attacking quartet. The hosts maintained their 4-2-3-1 shape when defending, staying compact in the central lane and forcing Newcastle to use the wider areas. The introduction of Fernando Llorente gave Tottenham a different attacking dimension. Direct play into the forward, and subsequent link-ups with central runners Lamela and Son, eventually led to the latter’s winning goal. Newcastle set up in a 5-4-1 formation that shifted to a 3-4-2-1 when they had possession. They looked to hit Salomon Rondon during transitional moments, with Ayoze Perez and Christian Atsu making diagonal runs inside to support the front man. The visitors’ deep 5-4-1 block frustrated the home side but made transitions of their own difficult because of the lack of runners available to support Rondon. The Magpies had most joy when getting numbers in central areas to pick up long balls and then play wide to the wing-backs, who could cross for the dangerous Rondon. Rafa Benitez set Newcastle up in a 4-5-1 formation targeted at frustrating Tottenham from the start. 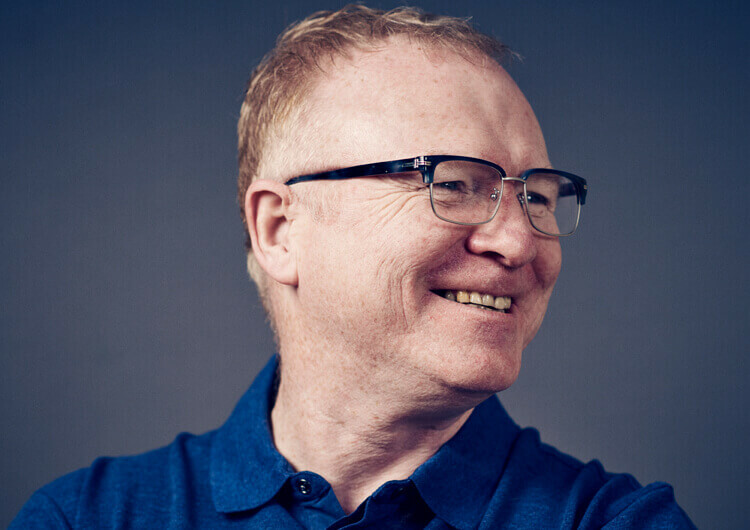 Their structure converted into a 3-4-2-1 in their brief moments of forward progress, with wing-backs Matt Ritchie and DeAndre Yedlin stepping forward to provide attacking width as soon as their team recovered possession. Wide midfielders Ayoze Perez and Christian Atsu would make diagonal runs inside, both to create space for the wing-backs and offer support to lone forward Salomon Rondon, who was naturally the first target for his teammates. 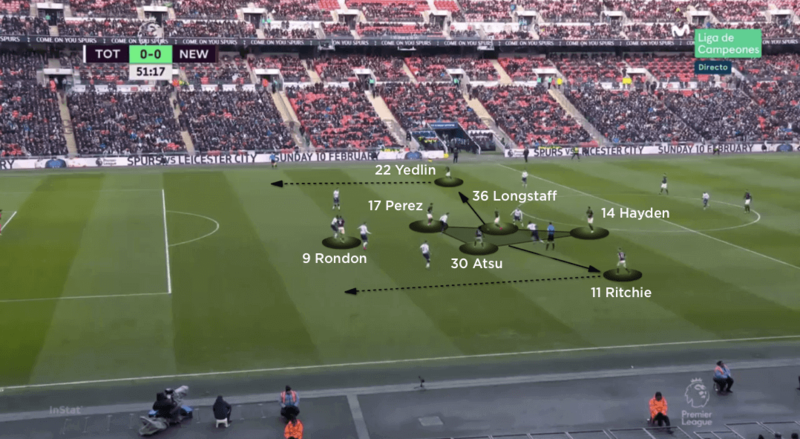 In truth, the visitors struggled to connect in attacking areas, with the inside movements of Perez and Atsu only bringing more defenders into an already overloaded situation against Rondon. Only when the powerful forward made runs away from the ball or chased long passes into the vast spaces in behind Tottenham’s high back line, where he would look to draw fouls or win throw-ins, did Newcastle even come close to threatening. It took them almost half an hour to produce anything even vaguely resembling an attack on goal, with Perez and Ritchie combining after a long goal-kick to create a chance for the former. It was blocked, as was Rondon’s effort on the rebound. The visitors actually created the first real chance of the second half. Another routine long ball led to them picking up possession thanks to their numbers in midfield – the ball was then worked wide to Yedlin, whose cross led to a Rondon effort that hit the post. The forward created one more chance for Perez, but his hold-up play suffered as he tired – and, with the wing-backs also running low on energy, Newcastle’s limited attacking threat subsided still more as the game entered its final phase. Out of possession, the visitors began in a very regimented 4-5-1 low-block structure, aiming to congest and frustrate any Tottenham play in the final third. Whenever they lost the ball, the wing-backs recovered into a back line of five. This left gaps in the wide areas they had vacated, with Tottenham’s full-backs quick to exploit them – particularly as Perez and Atsu had moved inside to support Rondon. 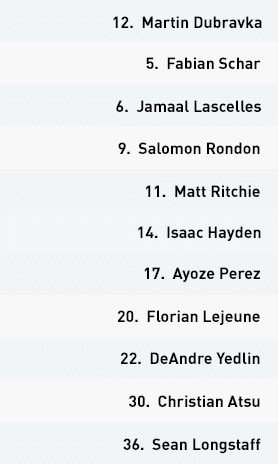 With Spurs creating more than one chances through this approach, Benitez responded by moving his wing-backs up to man-mark Vertonghan and Trippier. 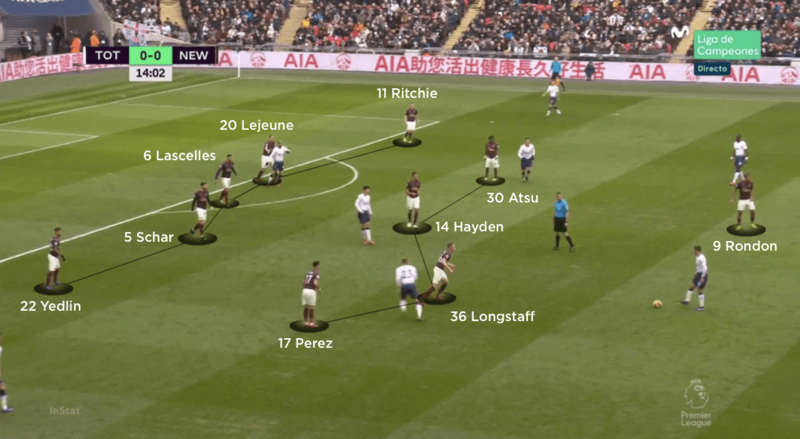 This now created gaps in the inside lane, where Son and Winks in particular looked to make intelligent runs – but Newcastle’s commitment to getting men behind the ball meant they were able to deal with any Spurs ball into their area. As Newcastle created more chances in the second half, their back line naturally moved higher to maintain the compactness between their units. As their wing-backs tired, however, Tottenham’s full-backs were granted more space to play crosses into substitute Llorente – it was from one such delivery that the ball eventually found its way to Son, whose low drive shouldn’t really have beaten Dubravka in the Newcastle goal. Defeat will have been a bitter pill to swallow for a side that had worked so hard across the 90 minutes.